And here we go again. It was time for the return of Blyth and Wallsend to the northern track and field league; this time bigger and better than ever. In case you somehow missed the news, we were champions of division 3E last season, victors, the biggest fish in our little pond. We achieved what had not been done in the club’s athletics history and secured promotion to division 2E of the league. So this year we find ourselves facing off against some serious competition. Other than ourselves and New Marske, who were promoted hot on our heels last season, we will be coming up against four other clubs. City of York; the most southern of our opponents, whose shiny university stadium we would be competing in for the first meeting. Gateshead Harriers; who are former division 1 competitors and renowned for producing some seriously good technical athletes. Morpeth Harriers; a club whose rivalry with us is longstanding. Last but not least is Skyrac AC; against whom we have battled before in division 3 and who have some very strong athletes. So the lines in the sand have been drawn and it was all to be kicked off in York. That morning I got up stupidly early to go and get in the car with Anne and Ralph for our little road trip. For a good hour at least, we were surrounded by thick fog, making the world grey and miserable. Given our history with the weather at these events, I wasn’t inclined to be optimistic. But a little further south the fog broke to reveal blue skies, Starship’s “Nothing’s gonna stop us now” came on the radio, and after pilfering some coffee and toffee from Ralph, I was in the mood for athletics. Unfortunately due to illness, unavailability and various other factors, the squad had a lot of drop outs and was severely reduced in number, so we all knew it was going to be a hard day of multi eventing if we were going to cover our bases. However, we arrived at the car park in a relaxed mood, Anne took a picture of some geese, we were charged unnecessarily for parking (£6 can you believe? ), and I admired the university’s custom soap dispensers. Just the usual routine before a competition. As the sun climbed, more competitors arrived, and Michelle began throwing her trousers at Ralph like a hammer, we knew it was time to get serious. The first event to kick off the day was the men’s hammer throw, with the tried and tested team of Ralph Dickinson and Paul Corrigan opening the show, Paul coming third in the A string to get us off to a great start. After whipping her trousers around her head a few more times, Wallsend’s Michelle Heron joined our own Anne Craddock for the women’s hammer. At the same time Becki Newman was taking on the long jump, with Alice Dungworth arriving somewhere in the middle of the competition to join her. But as I’ve always told my punctually challenged self, ‘better late than never’. By the time the first track event came around, we were off to a good start and more of our minimalist team joined us in the stands. Unfortunately, our day’s track racing got off to a bad start with Ella having to pull out of the 400m hurdles to avoid throwing up on the Skyrac runner outside of her. I would’ve advocated the second option just for shock value, but I think Ella made the right choice. However Becki was unfazed and struck home in the third place in the B string. Following this, majestically impressive as ever, Daniel N’Jai stormed the men’s 400m hurdles A race, scoring both a win, a personal best and a club record. My performance following that was something of an anti-climax as I ran a disappointing race, but still was able to hold on to 3rd place. Obviously my mood rubbed off on Peter Skirrow for the men’s long jump as, after having jumped 6.70m last week for a PB, he got two disqualified jumps on the day and had to settle for a much shorter counting jump than he is used to. Then one of our decorated captains, Paddy Dinsmore, stepped up to jump fantastically (beating my PB in the process). Becki and Michelle were Wallsend’s only ladies at the event, but they planned to prove true the rule ‘quality over quantity’ and set about taking on pretty much every event they possibly could, including teaming up to run the 800m. Not to be shown up by his clubmates, Denver Stretesky ran a blistering 800m in the men’s race (including a 61 second first lap I believe), with Joseph Dungworth making his return to the track in the B race. Meanwhile, over in the section of the stadium where strong people whip heavy bits of metal around, Paul Corrigan and Michael Day were throwing the discus in great style to bring home precious points for the team. Up next on the track was one of the most hotly contested events on the timetable, the 100m. Who better to take up the men’s challenge than green and white all-star Daniel? Running an exceptional 11.6 seconds, he brought home a very close third place. Blyth veteran, and all around beast, Dave Swalwell took on the B field, also getting third with a great season opener of 12.0 seconds. Alice Dungworth and Lauren Barrett paired up for the ladies sprint and were green and white blurs down the track as they ran fantastically. At the same time, Peter was making up for a disappointing long jump with an astonishing high jump, clearing 1.88m. A massive jump and a personal best to which he responded with “yeah, it was alright” in his usual unenthusiastic tone. Deadpan reaction aside, it was enough to win the A string, with Denver clearing 1.55m to win the B too; crucial points on the board. In the ladies shot putt, Michelle was back in action throwing 5.50m in the A, with Anne backing her up. Part two of the Wallsend women’s force, Becki, was in the triple jump with Lauren, their previous events just making them hungry for more. Lauren won a resounding cheer when she found the pit after a couple of not too successful jumps. Looming on the horizon for Paddy and I was the weird and wonderful (and bloody tough) 3000m steeplechase. Though with the sun scorching the track, that water jump was looking more and more enticing. Any nerves we had were quickly replaced by pain and expletives, but Paddy ran an excellent race to take second in the A race, whilst I pushed my tired legs (and wet feet) around in a good time; winning the B string as I was the only competitor. Sadly our depleted team were unable to field any runners in the women’s 100m hurdles, however Anne and Michelle did us proud in the discus. Becki continued her track attack as the sole runner in the 3000m, shoring up the team’s score. Meanwhile I was staring down the yawning void that is the 110m hurdles. Daniel could worry about taking on the field in the A string, as the only B competitor, I just had to finish to get big points (which is harder than it sounds as the hurdles are up to my chest and my legs were starting to feel heavy from two hard races in quick succession. Daniel brought home second place with a brilliant PB of 16.0 seconds (another club record!) and, despite some wobbly moments, I just about made it across the line in a time that doesn’t bear mentioning. At this point in the day we were comfortably ahead of New Marske on points and were level with Morpeth for fourth place. As might’ve been expected from their home competition, City of York were striding away in first. 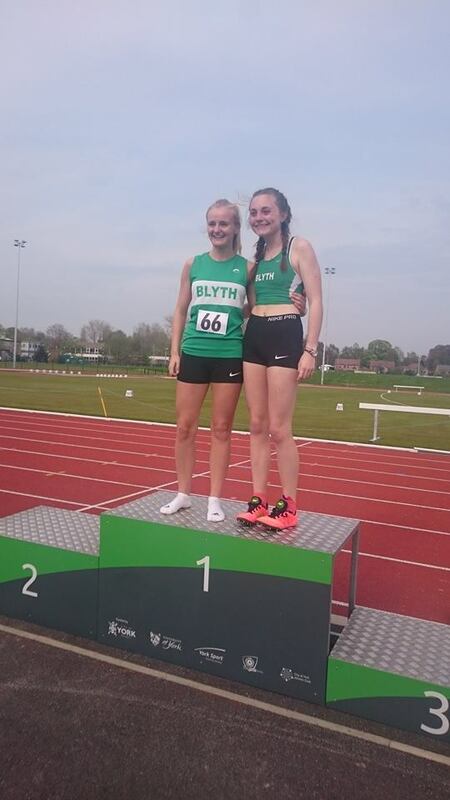 Eager to stay in the hunt, we turned to the 400m with Blyth’s sprint superstars Alice and Lauren who both ran flying races to take 3rd and 1st respectively. Lauren destroyed her 400m PB, running 62.1 seconds, an exceptional time by any standards. The men would need some true talent to follow a performance like that, but with Peter Skirrow and Simon Lyon waiting in wings, we were not short of talent by any reckoning. With times of 53.5 and 54.7 seconds (insert expression of jealousy here), they shot around the track to come home in 3rd and 4th place. With similarly impressive feats of power, Paul and Dave made the shot putt look like a tennis ball with big throws netting them two 3rd places in the A and B. Keeping the momentum going, the squad’s young guns Denver and Joseph challenged the 1500m field, both bring home 4th place finishes. Becki also ran a fast and furious 1500m for the women, with Lauren jogging a less fast and less furious race to give us a B athlete. The points kept racking up, but we had to keep pushing to keep up with Morpeth’s blue and white bounders. Upon her return to track and field from injury, Ella was clearly eager to impress as she took on the high jump for the first time ever, comfortably clearing 1.30m. However our thin-on-the-ground squad was beginning to tell as we couldn’t field a B athlete in this event either. Fortunately we could still put two strong athletes in the Javelin, with Dave and Michael scoring valuable points ahead of athletes from New Marske and Morpeth. Ella followed up her high jump with the 200m, joined by Michelle who was on about her millionth event by this point in the day. Daniel ran the A race for the men with a PB of 23.8. Running the B, in his senior league debut, was youngster Adam Swalwell who did himself proud with a strong run despite having been ill leading up to the competition. Apparently one stupidly long and gruelling event wasn’t enough for Paddy as he returned to the track for the 5000m, playing wingman to Simon against some awesome runners (the winner ran 15:52 for example). Both the gents ran well given that they were out in the heat for 12.5 laps. The final event before the day’s relays was the women’s javelin in which Anne and Michelle were back in action, bringing home a few more points for the tally. At this point Michelle and Becki’s efforts in multi-eventing were beginning to border on masochism, and yet they still got themselves fired up for the relays to come. It seemed just about every member of our skeleton crew was in one relay or another and, despite some heavy legs, performed admirably. Sadly, despite our best efforts, Morpeth were able to pull away from us near the end of the day, and we finished behind them in 5th position overall. Not a bad start to the season, but we have to push on now if we’re going to fight for our coveted place in this division. The next meeting is on Sunday 5th June at Gateshead stadium. Let’s rally the troops and go at it with all the green fury we can muster. See you there on the start line! More photos from the day available in the gallery here. « Joseph Hoben gets the Summer Grand Prix off to a flyer!